This New Orleans FRENCH QUARTER JOGGING TOUR is a 3 in 1 multifaceted tour, which includes the unique history of our amazing city and culture, Cemetery and information about traditional above ground tombs and burial processes, reported hauntings in the city and local recommendations and secrets on where to find the best music, food and fun! It is truly a JOGGING tour and NOT a running tour, with lots of stops along the way. It is designed for anyone who is regularly active! From the origins of the Mighty Mississippi River deposits to create the land where New Orleans stands today and to the depths of the swamps and the various cultural settlements that came in one by one, we take you on a journey through the fascinating stories of the Vieux Carre and the Garden District in the American Sector. We show you the architectural styles of the French, the Spanish and of course, the Americans along with an Afro Carribien influence. Enjoy your journey and your endorphines! We meet at Latrobe Park, at the corner of Decatur St. and Ursulines Ave., just 4 blocks from Cafe DuMonde, from there we leave on a journey to the Mighty Mississippi River and and talk of its origins. Then, we turn to the opposite side and see the incredible center of town, Jackson Square, where it all began with the French founder and the settlers in 1718. 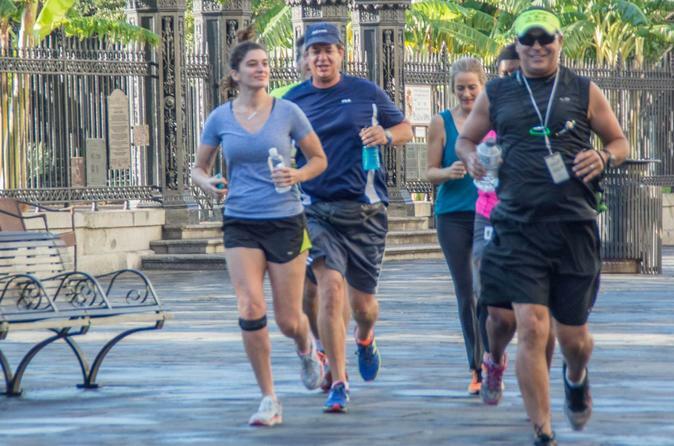 The journey continues as we jog our way into the square and talk about the amazing history, show you the beautiful St Louis Cathedral and the buildings that frame it. We then move through the French Quarter, dazzled by the brilliant colors of the beautiful architectural stlyes of the various cultures who settled here. Jogging into the Treme, we visualize the slaves gathering in Congo Square, celebrating their one and only day off every week, the Native Americans dancing, the Voodoo rituals, the market, and musical exchanges. We view a cemetery and talk about the burial process, the above ground tombs and the mass amounts of people buried there. We then jog into the Farborurg Marigny to the incredible music scene, Frenchmen street to discuss the locals hangouts and places to eat and play. The jog continues on as we move through the trendy neighborhood to see the homes, restaurants and businesses along the way, finally making our way back to the riverfront, enjoying the scenery, fresh air and of course, the friendly neighbors. we end our tour at the historic French Market, where you can shop, eat and have some libations. Come see us in New Orleans Y'all!